VW Beetle tyre pressure recommendations are very varied, However 22psi front and 28psi rear should be fine. Pirelli have produced two more 165R15 CINTURATO ™ tyres and Michelin have produced a new 155TR15 Michelin X that was original equipment on some of these cars. 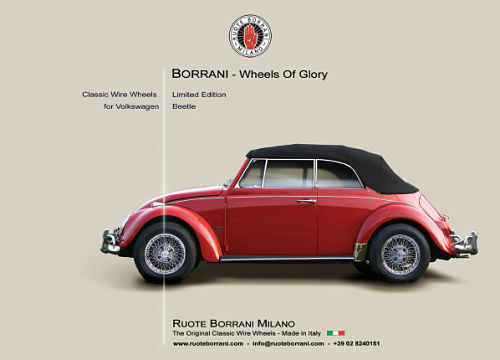 The VW Beetle from 1952 left the factory fitted with 4" rims 5.60x15 crossply tyres. Then in 1972 the Beetle fitted 4.5" rims with bias ply 6.00L15 with a 78% profile and 155R15 Michelin X as a radial option. 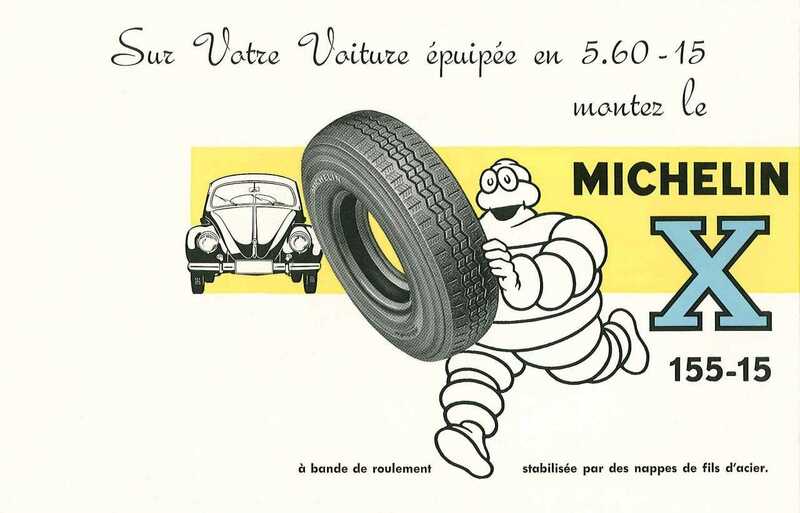 The Michelin, which is still available today, is one of the nicest driving tyres for a Beetle. 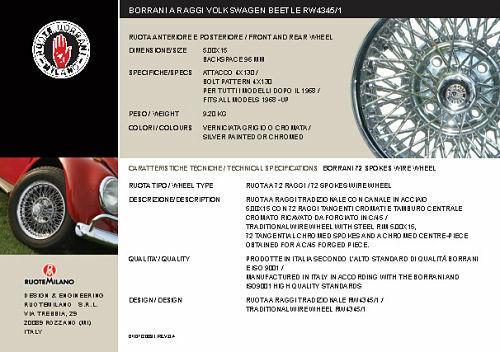 The best performance Volkswagen Beetle tyres for handling, quality, appearance and as the genuine period options would be the 1952 155HR15 PIRELLI CINTURATO ™ the 165HR15 Michelin XAS or 155R15 Michelin XAS. Currently the most popular tyre for a VW Beetle would be the 165SR15 Michelin XZX. This is because it was a tyre VW offered in period as an option for the Beetle (the 165R15 XZX was original equipment on VW's VW 411, VW 411L, VW 411 E and VW 411 LE models). The Michelin 165SR15 XZX is such a good option for the VW Bug and it is also incredibly good value for such a high quality genuine period tyre that was developed to compliment the VW Beetle and the extra diameter of the 165 tyre helps the gearing on modern motorways. The value of this Beetle tyre is dramatically increased by the SPECIAL OFFERS we are currently making for the Sets of 4 off 165SR15 Michelin XZX and Set of 5 off 165SR15 Michelin XZX below. Right back in the days while Volkswagen were still producing the Beetle people liked the "Cal Look" where the rear tyres were larger than the front. In period the Michelin X, ZX or XZX were used. That same look can be achieved by fitting the Michelin 165SR15 XZX on the rear and 145SR15 XZX or 135SR15 ZX on the front. Though the ZX and XZX are different tread patterns the difference is minimal, and they give the same look. We are pleased to be able to offer 155HR15 Galaxy White Wall and 165HR15 Galaxy Whitewall tyre with a 20 mm whitewall band. These are perfect for the Volkswagen Beetle owner who wants to embellish their car with a white wall tyre without being overly expensive. There are other white wall options out there that come and go a little. It might well be worth telephoning us to find out what is best for you on +44 (0) 1302 711 123. In 1934 Adolf Hitler was searching for a people's car that was capable of transporting three children and two adults at speeds of sixty miles-per-hour on the newly developed autobahns. The car was to be inexpensive, costing the same as a motorcycle. Ferdinand Porsche was commissioned to produce such a vehicle. There are many theories as to where the designs originated from. Some believe Hitler designed the vehicle. Some theorize that it was Joseph Ganz's 1920 design that was the true inspiration for the Beetle design. Porsche had created designs for the Mercedes-Benz 170H, which played into the design of the Beetle. Inspiration for the Beetle had been drawn from the Tatra vehicles, mainly the T97, that had been designed by Hans Ledwinka. Due to the similarities, Tatra launched a lawsuit which never really materialized due to Germany invading Czechoslovakia. The lawsuit was later re-opened after World War II and Volkswagen was forced to pay Tatra 3,000,000 Deutsche Marks. This left Volkswagen with little money for development of new Beetle models. The Volkswagen Type 1 first officially came into production in 1947, but they were known by a different name, KdF, short for Kraft durch Freude meaning 'power by joy'. In English, the name Beetle was used. In Germany, they were known as Kafer, and in France they were called Coccinelle. These little bundles of joy featured mechanical drum brakes (with early versions operated by cables) a gearbox void of synchromesh and virtually no chrome or embellishments. In 1949 the Volkswagen logo was stamped on the rims. The engine was expanded to 1131 cc and was capable of producing 25 horsepower. The models that were produced after October of 1949 had the luxury of an electric starter motor! Two convertible options were offered by Volkswagen in 1949. The two-seater design, designated 14A, was penned by Josef Hebmuller. The four-seater Type 15 version was designed and produced by Karmann of Osnabruck. The four-seater was vastly more popular and stayed in production for 30 years. The 14A was stylish and attractive, however a fire destroyed the factory halting production and thus making the Hebmuller very rare. The two-seaters featured a rear deck nearly identical to the front boot/bonnet. The strength of the car, lost by removing the roof, was reinforced by a stronger windscreen surround and dual Z-section girders located under the floor. In 1953, the last of the Hebmuller rolled off the assembly line, after only 696 examples were produced. In a time when practicality ruled over style, the four-seater Karmann cabriolet was king. The Karmann company had a long history of designing and building cars. In business since 1901, the company was familiar with assembly line production and the benefits and features of different types of metals. During the 1950's the Beetle saw exterior and interior improvements. 1951 saw the addition of arm-rests which were discontinued just a few months later. In 1952, 2nd-4th gears became synchronized and the mechanical, cable-driven brakes were replaced with hydraulic brakes. The dashboard was redesigned with a glove compartment. In 1955, the bumper was improved and electrical direction-indicators were installed. A second tail-pipe was added. The front seats became wider and could be moved to three different seat-back adjustable positions. In 1956, the tires became tubeless. Near the end of '56, side view mirrors became standard on all Beetle models. In 1957 the front window was increased by 17 percent while the rear window received a 95 percent increase, losing the novel "oval" window. A new dashboard, rear view mirror, radio, and a speaker appeared. The indicators would now turn-off automatically. Up to this point, a roller pedal had been used to initiate acceleration. This was the year that the accelerator pedal replaced the roller pedal. In 1958, ivory disc wheels were offered. In 1960, an engine capable of producing 34 horsepower was offered. The speedometer was increased from 74 mph to 87 mph. A windshield-wiper washer system became available. The front indicator light was changed from white to amber. A fuel gauge was added in July of 1961. In 1963, the seats were changed from wool upholstery to synthetic. The VW emblem located on the hubcap was no longer painted. The safety of the vehicle was once-again enhanced with the enlargement of the indicators. There were minor changes in 1964. The windows did, however, become larger. In 1965, the front axle was improved. The ongoing saga of incremental improvements received another chapter - A defroster vent was added to the center of the dashboard. 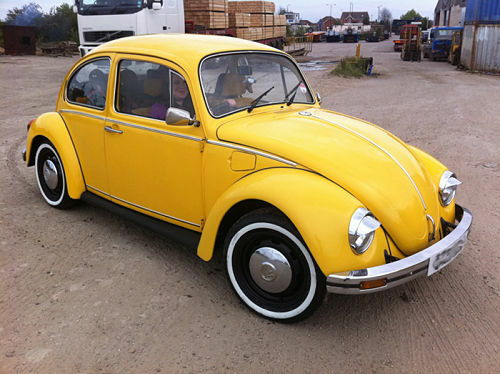 In 1971, while production of the "standard" Beetle continued, the Super Beetle was introduced, produced from 1971 to 1979 (1302s from 1971 to 1972, and 1303s from 1973 onwards), offered the macpherson strut front suspension, which required a significant redesign of the front end. This resulted in a better turning circle, and the stretched "nose" of the vehicle which permitted the relocation of the spare tire from a near vertical to a low horizontal position, this opened up approximately double the usable luggage space in the front compartment. Air pressure was used from the spare tire to pressurize the windscreen washer bottle, as an electric pump was not used to deploy windscreen washer fluid for windscreen cleaning. 1972 Super Beetles had a slightly larger rear window, larger front brakes, and four rows of vents on the engine lid. The rear lights now incorporated reversing lights. The "four spoke" steering wheel and steering column were re-enginneered to the "energy absorbing" design for better crash safety!!! In 1973, the introduction of a more aerodynamically curved windscreen pushed it forward and away from the passengers, purportedly due to American Department of Transportation safety requirements. This allowed for a redesigned "padded" dashboard .A 2-speed heater fan, higher rear wheel arches and larger rear lights were added. The changes to the heater/windscreen wiper housing and curved windscreen resulted in slight redesign of the bonnet, making the 1971 and 1972 Super Beetle bonnets unique. For 1974 the previous flat steel bumper mounting brackets were replaced with tubular "self restoring energy absorbing" attachments, effectively shock absorbers for the bumpers. The steering knuckle and consequently the lower attach point of the strut was redesigned to improve handling and stability in the event of a tire blowout. This makes the struts from pre-74 Super Beetles not interchangable with 1974-79 makes. 1975 brought the replacement of carburetors with Air Flow Control (AFC) Fuel Injection on American Beetles, a derivative of the more complex Bosch fuel injection system used in the Volkswagen Type III. The fuel injected engine also received a new silencer and the option of an upstream catalytic converter , necessitating a bulge in the rear apron sheet metal directly under the rear bumper, and replacing the distinctive dual "pea shooter" pipes with a single offset tailpipe, all of which make the fuel injected models easy to identify at a glance. Other changes were rack and pinion steering vs. the traditional worm and roller gearbox, and a larger number plate lamp housing below the engine lid. The front indicators were moved from the top of the mud guards into the bumper bars on European models, a portend of the "Euro look" or "cal look" style years later by Beetle fanatics. In 1976, the hard top Super Beetle and 1300 were discontinued (though convertibles remained Super Beetles through 1979) and replaced with an 'improved' standard Beetle with 1600 cc engine, independant rear suspension and front disc brakes. The "Auto-stick" transmission was dropped. 1976-on Super Beetles saw no significant engineering changes, only a few cosmetic touches and new paint options, including the "Champagne Edition" models to the final 1979 "Epiloge Edition" black on black, in salute to the first beetles ever produced.